Originally published in The Smithfield Times, July, 2015. Ernest DiChiaro of Providence is one of those rare individuals who has died and gone to heaven – twice – and returned to tell the tale. 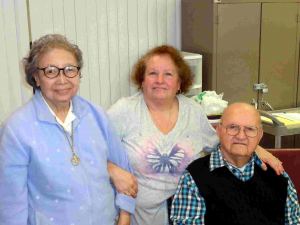 On Saturday, March 28th, he recounted his experiences to a small Bible study class at the Franciscan Missionaries of Mary in North Providence. One night in 2001, Ernie awoke with chest pains and was taken to a nearby hospital. The doctors determined it was a heart attack, and immediately scheduled him for heart by-pass surgery – a risky operation especially for someone of advanced years, but necessary to save his life. As the doctors operated, Ernie remembers standing at the gates of Heaven. “The gates were shiny”, he recalled, “and everything was white. It was very beautiful.” Then his former brother-in-law Pete approached him. “Ernie”, Pete said, “I’m going to take you to see your father.” Pete had died several years previously when he was in his 60s, but now Ernie saw him as a young man. “It seemed like everybody there was young.” said Ernie. The next thing he can remember was waking up in his hospital bed. He didn’t know it then, but one day he would visit Heaven a second time. Evidently God had other plans, for in 1942, Ernie entered the Army to do his part for Uncle Sam during World War II. He was trained as an armoror (Someone who works with guns and ordinance) and sent to Newport News, Virginia, to be assigned for overseas duty. As it turned out, the base he and twenty others from his class were sent to was placed under quarantine and they were told they couldn’t leave. Twenty other men were sent in their place, and Ernie later found out that they were all killed. From Virginia he was assigned to an airfield in Bermuda where he spent the rest of the war. There he encouraged others he worked with to attend church services with him, and some of them did. Ernie recalled, “When guys’ saw us coming they would say, ‘here come the altar boys!’” One could say he was evangelizing while in the army, the start to a path he would follow later in life. Before the war he had been introduced to a pretty girl named Evelyn, who like Ernie, had a deep spiritual faith. ”Her sister married my brother.” He recalled. During the war they wrote to each other constantly, and were married June 18, 1945, and were later blessed with three children; two girls, one boy. Ernie took a job in the Providence post office, but later did cement work, before eventually owning his own cleaning business, called “REEL-Y-KLEEN FLOORS, which he ran from his home in Greenville. After retirement he and Evelyn eventually moved to an assisted living facility in Providence. Throughout their marriage the couple had a devotion to St. Jude, the patron saint of lost causes, and they kept a large statue of the saint on the mantle in their living room. Ernie is convinced St. Jude came to his aid the second time he visited Heaven. As with his first heart attack, Ernie awoke one morning with chest pains and trouble breathing. At the hospital a doctor determined his right lung was filling with fluid, so he used a long needle to drain it. In doing so he accidentally punctured a blood vessel and Ernie began to slowly bleed to death internally. He was rushed to surgery holding a Rosary in his hands, and during the operation he suddenly found himself walking along a peaceful unpaved country lane with beautiful bright green grass on either side. There he encountered St. Jude, who led him to meet Jesus. Jesus told him he would send him back, but made Ernie promise to help the people at his assisted living facility with religious programs. Ernie promised, and when he woke up he found himself in a hospital bed, his legs and half his throat paralyzed. Nobody knew why. Ernie’s faith in Jesus and St. Jude left no doubt in his mind that he would walk and talk again, but those at the nursing home where he was sent for rehabilitation didn’t share his views. “The girls (Physical Therapists) told me, give it up, you’re never going walk!” I told them, ‘I am going to walk!’” All the while he prayed to St. Jude. Images of Mary and Jesus are on the altar with a battery operated candle between them. Now the chapel has the feeling of a place of solace and prayer. In addition, Ernie organized other religious activities such as holy masses, stations of the cross, Bible study, praying the Rosary, novenas, and playing religious music. A retired priest lives at the facility, and Ernie helps him with the masses. At the age of 92, he recently became an altar boy! It is said that the bond of love can’t be broken, even by death, and Ernie would agree. Evelyn passed away about a year ago, but Ernie still feels her presence. “I know she’s around me,” he said, and went on to relate how he keeps some battery operated candles on his window sill which still have the original batteries after two-and-a-half years. Since Evelyn’s passing they turn on by themselves every day. There’s also a ceramic clock Evelyn made that acts erratically. It keeps changing time, and sometimes the hands are bent. His daughter Cheryl had the inner workings replaced, but the behavior continues. Then there is the sound of Evelyn’s voice. “Sometimes when I nap in my chair before breakfast she wakes me up and says, ‘c’mon Hon, it’s time to get up.’” And when he’s praying in the chapel, he can feel her sitting beside him. People like Ernie who have seen the other side no longer fear life’s end. As Ernie said, “I’m not afraid to die – I’m looking forward to it because I know where I’m going to go.” And he knows he and Evelyn will be together again. On April 19, 2016, I went to visit Ernie at a healthcare center in Greenville, Rhode Island, after his daughter Cheryl had contacted me telling me there was more to add to Ernie’s story. Shortly before Christmas, Ernie had been admitted to the V.A. Hospital in Providence with heart problems and trouble breathing. He was discharged a few days later, but was back in the hospital by New Year’s Eve. Doctors told him his prognosis was grim, and by March 10th his health situation had deteriorated to a point where he was transferred to a health care facility in Greenville, and put under Hospice care. On March 15th Ernie was administered the Catholic rite of the “anointing of the sick” by Fr. Varghese of St. Eugene’s parish in Chepachet. That night he awoke to see Jesus and St. Jude standing next to his bed. He’s sure he wasn’t dreaming. Both apologized to him for asking him to bring religious programs to the assisted living facility where he lived, for they knew it had taken a toll on his health. (Ernie was frustrated over the lack response by those living at the facility – it seemed many didn’t care about religion.) But he’d persevered, and had done what they’d asked. While standing in his room, Jesus and St. Jude assured Ernie that he was going to recover from his ailments, and he did. When he came to Greenville he needed constant oxygen due to his breathing problems. Now he doesn’t. His heart has gotten stronger, and he’s now able to walk, (with a walker), which was something he couldn’t do before. “I wasn’t even allowed to walk to the dining room.” He told me. He also had trouble swallowing, and that affliction has also disappeared. Meanwhile he continues to evangelize when he can. Each night after dinner, he says the Rosary with his friend Edna, who’s 99. Her health has improved to the point where she will soon be going home. “I’m blessed,” he stated, “When I pray for someone, they always get better.” He then went on to relate how his daughter Janice, who’d had cancer in three places, and his sister Irene, who also suffered from cancer, are both now free of the disease. He attributes their healings to his prayers to St. Jude. He also related how he prayed for others at the assisted living home in Providence. Ernie can’t return to the assisted living facility, but he’s happy to be where he is in Greenville. The walls of his room are adorned with pictures of Jesus, Mary, and his wife, Evelyn, whose presence he still feels. He prays every day, and encourages others to do the same.